Don't know why, but these in that colour remind me of Slade, Wizard, The Sweet, Alex Harvey Band and all that era. Don't know if any of those bands used one, or maybe I saw something on TOTP2. Slade's bassist used a red EB3, well remembered. The other bands mentioned used Fender basses according to Google image search. So, I've seen a YouTube video where someone gouged a chunk out of the back to add the bridge pickup to add the new volume pot. On this Indonesian-made model it looks like the control cavity is routed for EB-3 or SG Bass controls. The control cavity cover plate is such a tight fit I can't get it out without risking some damage. I can't get a credit card in there and everything else seems too flimsy. Still, no urgency; Allparts do a bridge pickup but they're out of stock of both EB-style pickups. 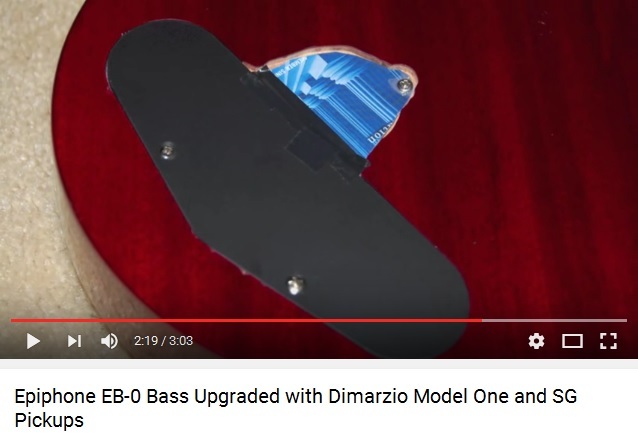 DiMarzio don't seem to do a bridge pickup, Stuart Duncan does nothing Gibson-ish. I could do with some good pictures of how the EB-3 or SG Bass does its wiring. Poke it out through the jack? Brilliant idea, Paul. I'll have a go. Plenty of room for more pots. I'm guessing I would need to rout a cavity for the bridge humbucker, i.e. it's not surface mounted, but the Allparts site only has one picture which doesn't help a lot. There are several options for surface mounted pickups. Rick style pickups, Lace makes one, the USAB. You don't have to route for a pickup if you don't want to. My favorite way of getting those back covers is to use the shower/mirror pressure cup things you get at bath stores. The cavity looks coated, it could just be lacquer but I'm sure you can get clear RF paint. Paul's idea worked fine, but honeyiscool's idea is one to bear in mind where stick-a-screwdriver-through-the-jack-socket isn't an option. The cover has a metallic back but there's nothing to connect it to when you screw it on. That said, all the wiring is screened and I didn't notice any significant noise at the jams Sunday or tonight; recording might be different matter. Somewhere I have some conductive tape. I'll have a look at Lace tomorrow, bed time now. OK, the Lace USAB is out the window, a �139 pickup on a �179 guitar doesn't make sense.